Martha has more than 20 years of experience advising and representing clients on a broad range of employment law issues and in adversarial proceedings. In her role as an advisor to employers, boards of directors, and executives, she regularly provides practical advice and counsel on a wide range of employment-related issues, including employee relations and policy matters; employee classification and wage and hour laws; violations of noncompetition, nonsolicitation, and nondisclosure agreements; employee training; employment and separation agreements; affirmative action; mergers and acquisitions; and internal investigations. Martha has represented clients before administrative and governmental agencies, courts, arbitrators, and mediators. 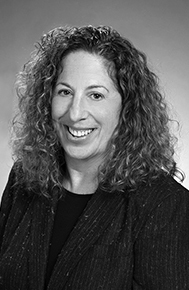 Before joining Bello / Welsh, Martha was Of Counsel to Mintz Levin, a large Boston law firm, where she was a member of the Employment, Labor and Benefits department. From 1994 through 2007, Martha was corporate counsel for Keane, Inc., a billion-dollar multinational corporation with, at its peak, approximately 12,000 employees. Beyond her responsibilities as the sole employment lawyer for Keane, (now NTT DATA, Inc.) Martha assisted the company with Sarbanes-Oxley compliance, corporate governance, M&A due diligence, SEC matters, and risk assessment. Prior to joining Keane in 1994, Martha was with another major Boston law firm. Martha was the Editor of and a frequent contributor to Mintz Levin’s Employment, Labor & Benefits blog, Employment Matters. She is frequently asked to provide expert commentary on various employment issues, and has appeared on The Emily Rooney Show and been quoted in MSNBC.com, Boston Business Journal, Business Insurance, and Workforce Management, among other publications. Martha is admitted to practice in Massachusetts and Washington, D.C., and before the Federal District Court in Massachusetts, the First Circuit Court of Appeals and the Central District of Illinois. She received her B.A. from Emory University, her M.A. in Psychology from Boston College, and her J.D. from Boston College Law School.